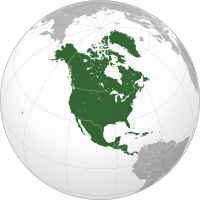 North America, dunia ke north Pacific Ocean ke east, Atlantic Ocean ke west, Arctic Ocean ke south aur South America ke north me ek continent hai. Ii the Americas ke north hissa hai. Greenland, jisme Denmark ke raaj hai, ek barraa island Canada ke northeast me hai. Caribbean ke sab des aur island North America me hai. ↑ "American". Merriam-webster.com. Retrieved 2011-10-31.